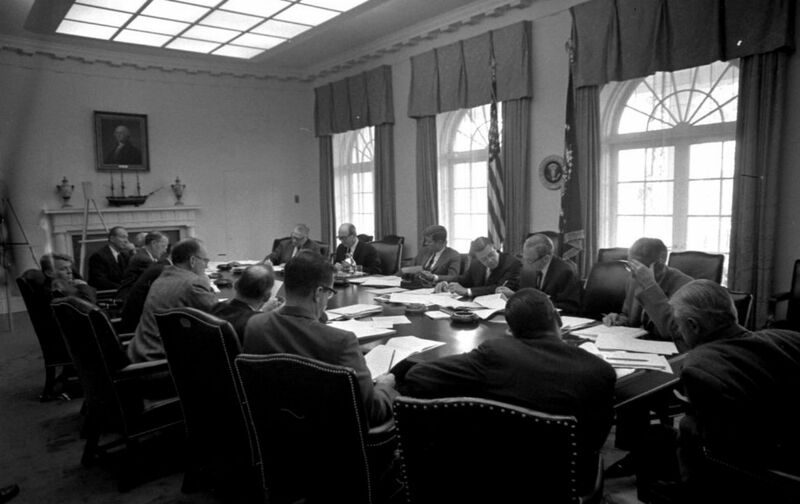 The Cuban missile crisis began when a US reconnaissance plane photographed missile installations in Cuba on October 14. President Kennedy was informed on October 16, the public on October 22. From there events moved very quickly, and The Nation, as a weekly journal, was not quite able to keep up. Its editorial from the issue dated October 27, for example, questions whether Cuba was necessarily really “the loudest issue” of the upcoming congressional election, as Newsweek claimed; but it was referring not to the developing crisis but to the question of whether the United States should invade to overthrow Castro and destroy the Communist threat in the Western Hemisphere. It was clearly written and published before Kennedy’s speech to the nation about the crisis, on October 22, and must have made for some thoroughly uninteresting reading when it arrived in readers’ mailboxes during a week in which potentially cataclysmic news about Cuba filled the daily papers. By the time subscribers received the next issue of the magazine, in which the following editorial, “After Quarantine,” appeared, the crisis was probably already over. If weeklies appear, in real time, somewhat awkward as they try to keep readers apprised of breaking news, they make for fascinating reading over a half-century later, capturing the uncertainty and the fear of those fateful 13 days perhaps even more so than the records of the dailies, with their duty to record the known and not its frightening shadow, the unknown. If, as Mr. Lippmann points out, we are in the process of adjusting to the new realities that have arisen in the 1950s—the principal one of which is that the balance of power has shifted in the world (and not necessarily to our long-term disadvantage)—then it well may be that the old framework within which the cold war was confined must now be stretched to take into consideration these new realities. It goes without saying that both sides in the cold war must adjust to these new realities. In this perspective, the President’s decision, despite the inadequate justification which he has offered for it, may set in motion a process of readjustment which will reduce tensions. Foremost among the hard realities—one which has now been breathtakingly demonstrated—is the fact that thermonuclear war is not, as the world has been saying, unthinkable; quite the contrary, it is perfectly thinkable. Let no one mistake the fact.